Shock resistant and water resistant up to 200 meters, with clear translucent design. Shock Resistant. 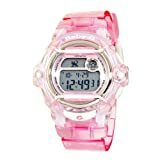 200 meter depth water resistant. EL Backlight with Afterglow. 25 Page Databank. Countdown timer. World Time (30 Cities). 5 Day Counters. 1/100 Sec. Stopwatch. Alarm. Hourly Time Signal. Auto Calendar. 12/24 Hour Formats. 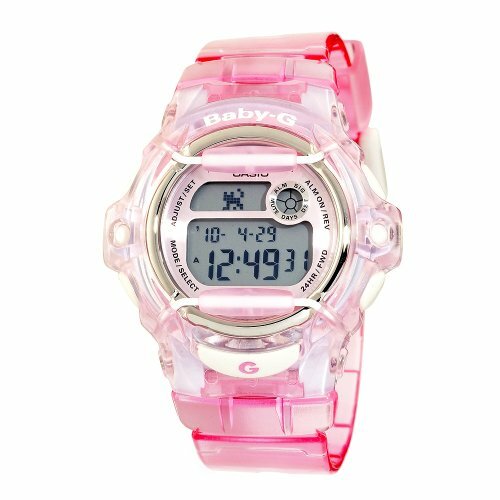 Casio Baby G Whale Series Ladies Watch BG169R-4DR.